Travel far and wide to track an infamous beast and reclaim your castle. "I really liked this game and all of the Incredible Dracula series. The story line is cute, and I like that they also offer side quests to do as well as the game itself." 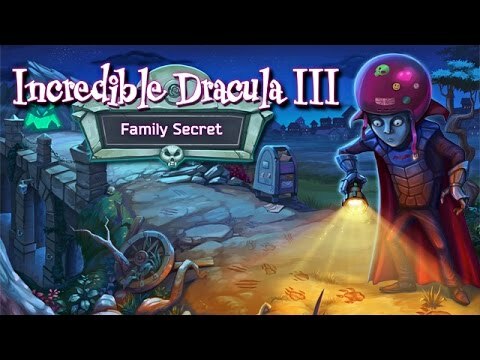 Save Dracula from the unspeakable horror of pesky relatives in Incredible Dracula III: Family Secret. When a gaggle of Dracula's distant kinfolk shows up at his castle expecting a warm welcome from their cold-blooded host, he begrudgingly accommodates them. But when they won't leave, his patience wears thin. To send them on their way and reclaim his former title as Lord of the Castle, he'll have to capture the creature that demolished his family's estates and return their homes to pristine condition. Join Dracula and his zombified servant Rufus as they travel far and wide to track the beast and repair the damage it has done. I like the Incredible Dracula series, including the challenge and the humor. You have to think and plan. I love this type of game. It holds my interest and keeps me entertained for hours. I will replay it many times. I love all the Incredible Dracula games. Lots of stuff going on and I love all the levels. Great story line and always something new! I have all three of the series. Was happy to see another one. Fun story and characters -- and fast paced! I love everything about the game. The story was great. Loved the way you can give the characters more then one task.